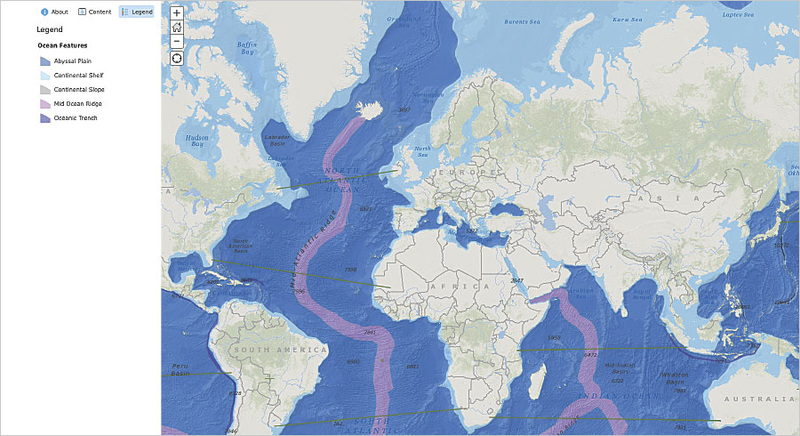 This ocean features GeoInquiries activity for earth science, grades 6–9, helps students categorize areas of the ocean and understand their significance. A high school teacher is nervous as he enters his fifth-period US history class. His tenth graders are restless and distracted. It’s late in the semester, and the last thing they want to think about is today’s dry lesson on the Dust Bowl—when a severe four-year drought in the 1930s swept incredible amounts of dirt across the Great Plains of the United States. Reluctantly, the students turn to the assigned chapter in their 15-year-old textbooks. Then, the teacher makes his move. He asks the class to look up from their books’ faded maps to the whiteboard, where he’s projected a map from ArcGIS Online. With growing confidence, the teacher zooms, pans, and toggles map layers on and off to illustrate his narrative. The students watch the map come alive. The teacher guides his class through the geographic inquiry process. Students ask questions about the population and farming in the affected states at the time. They acquire additional information, such as data about the soil and dust, as well as precipitation trends. They explore and interpret evidence of migration. They analyze the environmental causes of the dust storms. Finally, they reach evidence-based conclusions about the effects of human interactions with the environment. For most of the 15-minute activity, the students forget to be bored. And in the breakroom after class, the teacher shares with colleagues his newfound, end-of-semester success with GeoInquiries and ArcGIS Online. This teacher, like many across the United States, heard about Esri and ArcGIS through ConnectED, an initiative launched by then-US president Barack Obama in 2013 to make American schools more technologically savvy. 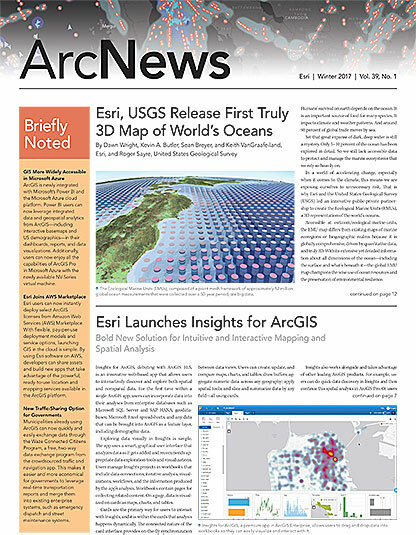 The administration encouraged private technology companies to make in-kind contributions to ConnectED, and in 2014 Esri founder and president Jack Dangermond offered to donate ArcGIS Online to every public, private, and home school in the United States. Approximately 4,000 schools have activated ArcGIS Online accounts, and Esri receives new requests every day. Users have viewed and downloaded hundreds of thousands of GeoInquiries lessons; attended and conducted a few hundred teacher training events; and volunteered a thousand times over as GeoMentors, helping teachers across the country implement and teach with ArcGIS Online. After having invested more than $40 million in ConnectED software donations, curriculum solutions, training, and support for K–12 teachers in the United States, Dangermond pledged in September to continue participating in ConnectED through 2019. This renewed commitment means that teachers and schools can take advantage of software donations and teacher support for years to come. Esri will also create additional GeoInquiry collections and persist in supporting the American Association of Geographers’ efforts to recruit GeoMentors and pair them with schools and teachers around the country. Additionally, Esri pledged in December to offer ArcGIS Online free of charge to 300 primary and secondary schools, as well as vocational institutions, in 10 European Union member states by the end of 2017. Dangermond also announced in October that Esri will launch ConnectED programs for schools in Australia and New Zealand. And talks about establishing similar programs for schools in other countries—supported by Esri’s international distributors—are currently under way. This means that more educators and students around the world will discover the power of GIS and spatial thinking. Also, more teachers will find out about GeoInquiries, concise classroom activities that guide learners through the geographic inquiry process. These free, one-page, Creative Commons-licensed instructional guides include web maps that are accessible even without logging in to ArcGIS Online. Esri and its educational consultants, along with content producers maps.com, GISetc, and the University of Minnesota, have created GeoInquiry collections for US history, environmental science, earth science, integrated elementary (fourth grade), and advanced-placement (AP) human geography courses. Collections for world history, American literature, mathematics, and more, are in the works. Each collection includes 15 GeoInquiry activities that are expertly aligned with educational standards and widely used textbooks. They are designed to fit into existing lesson plans and take only a few minutes to acquire and master. With GeoInquiries, any teacher can be a quick study in GIS. Meanwhile, back in the breakroom, the history teacher listens to his colleague share how she has been helping her students learn environmental science with GIS for the last 20 years. She talks about how GIS technology supports problem-based learning. She describes the challenges and triumphs of coaching teams of students as they conduct citizen science-based inquiries into social and environmental problems such as pollution, habitat restoration, and environmental justice. The history teacher quickly realizes that GeoInquiries and ArcGIS Online are a gateway to a wide world of possibilities in teaching and learning from a geographic perspective. Visit Esri’s ConnectED program for more information.